Reality is a difficult concept to discuss when applied to cinema. The authenticity of a created reality is already a contradiction to begin with, so the best of filmmakers move around and ignore this concept in its aesthetic guise. However, when faced with making documentary cinema, the idea of playing loose with reality in order to heighten the meaning and intent of real-world situations can moralistically undermine and raise questions of legitimate potency. In spite of this, and with an emphasis on using construction as a means of finding an uncomfortable and repressed truth, Lionel Rogosin‘s 1959 film, Come Back, Africa, suggests that the end spotlight result is very much worth braving a constructed tight-rope. Although listed as a documentary, Come Back, Africa is a partly dramatised and set-up narrative surrounding the plight of Zachariah, a struggling man in South Africa who is trying to find a consistent job in order to support his family. Rogosin is clear, however, that the mixture of documentary technique (shooting genuine footage of cities, places and people) and fictionalised accounts create a truth that would be difficult to film ad hoc; the man’s struggle was no doubt a common and universal occurrence. Adding to this is the fact that all of the performers are non-professionals and play themselves to a degree, using their own names and even allowing some filming within their homes. Rogosin’s previous film, On The Bowery (1956), had used similar techniques to highlight the lives of homeless Americans facing comparable struggles in finding sustainable work. Come Back, Africa has the added element of apartheid to question, making it a far more complex and, at times, deeply emotional film. Zachariah is a name derived with the Hebrew for ‘God Has Remembered’, and it is a name of contrasts for the world that the man faces; in many ways, the society he is trying to survive in desperately wants to forget that he exists entirely. 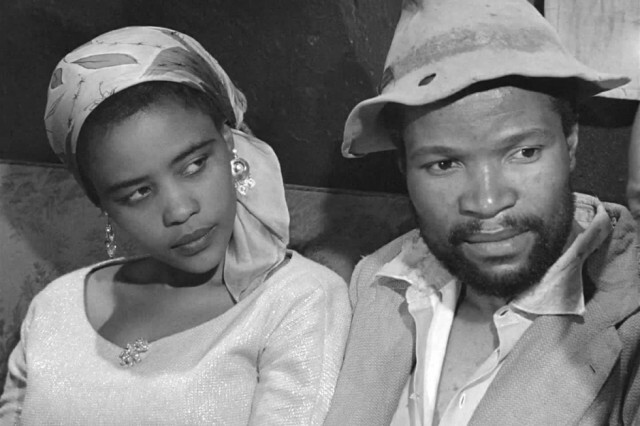 After finding out that signing on at a gold mine means he’ll get sent straight back to Johannesburg after finishing the low-paid, arduous work, he becomes a ‘house boy’ for a horrendous colonial couple. Rogosin clearly wants to highlight the rattling mentality of apartheid supporters and his characters do so with an uncomfortable, zealous ease. Zachariah accidently throws a bowl of soup away whilst working in the kitchen and is called “a savage”; that nasty, incomparable word that simply drips with colonial privilege and affluence. The film is clearly a tragedy in many regards (its ending is powerful in its raw emotional outpouring) but there’s also great warmth and humour besides. When finding a bottle of whiskey hidden under some clothes, he takes a few drams and dances innocently to some music on the radio, all the while mooching about in the scarf of his employer. It not only marks Zachariah out as a far more interesting character, but his movements throughout the film show him as a nervous mouse which provides humour against the backdrop of economic and racial brutality. Though it ultimately gets him the sack, it is the small moments of humour like this that provide the vision of Come Back, Africa with a greater sense of completeness. Rogosin seems to be pioneering social cinematic comment through dramatic intention in the same way that Ken Loach would experiment with a few years later. Whilst he cites the documentary filmmaker Robert Flaherty as a chief influence, there is a sense that Rogosin took the manufactured element of documentary filmmaking and turned it into something completely new. On the flip-side, there’s a stark resemblance between the eerie high-rise blocks and industrial zones of Johannesburg that Rogosin shoots and the blank high-rise spaces that fill Pedro Costa’s stunning Colossal Youth (2006); Costa also seems to have adapted Rogosin’s mixed form technique. Both films create that sense of the individual being pressured by a surrounding environment. In Liverpool, Come Back, Africa is being programmed by Elsewhere Cinema and their reasoning behind the choice is suggestive: “We watched the film for the first time during the Ferguson riots and it made us feel that nothing had changed, really. We thought the political statements it was making are as relevant now as they were then.” Nevertheless centred heavily on economic plight, Come Back, Africa succeeds in showing the massive racial inequalities of the place and time, and the scars of colonialism that can slowly haemorrhage drama. Zachariah is said to be from Zululand; that heavily fought-over area that eventually landed into British hands before the Second Boer War was even to begin. The place is now one of South Africa’s zoned provinces, the KwaZulu-Natal, having joined the Natal region post-apartheid in 1994. As Zachariah, so named of remembrance, struggles to find a place of his own, and a position in town that won’t get him into trouble with the racist forces that dominate the city, we can’t help but feel sorry for him. The complexities of place lead to the complexities of the man; fragmented, owned, abused, run down.